We are sad to share the passing in March 2016 of one of our founders, Burt Schildhouse. His signature is enshrined on CIP’s original articles of incorporation, signed July 22, 1970, which hangs in our office. Most important is the legacy that Burt leaves as a dedicated public servant who had the vision and ability to develop the city of Columbus and our organization. Our thoughts are with Burt’s wife, Ruth, and his family and friends. Burt’s obituary can be found here. The Center for Somali Women's Enhancement aims to provide services such as ESL, employment assistance, and housing aid to Somali immigrants in Ohio through their community-based platform. The Ohio State University College of Engineering Chapter Engineers Without Borders is presented the Schildhouse Grant Award by CIP Board Members. 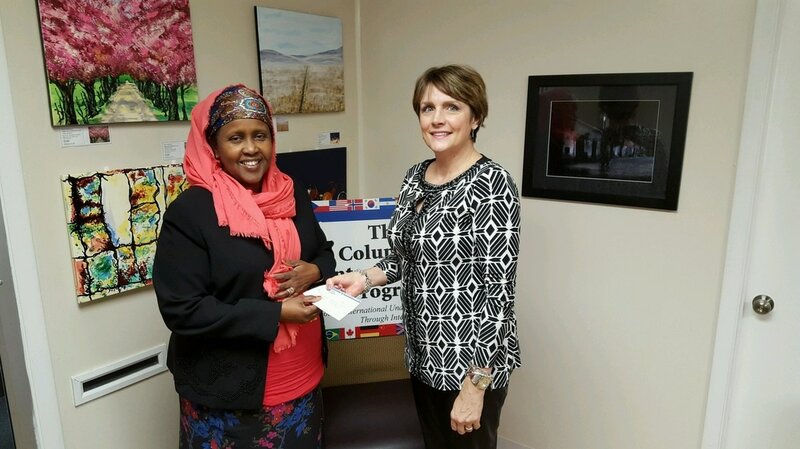 Khadra Mohamed, MSW, the Executive Director of the Center for Somali Women's Empowerment, is presented the Schildhouse Grant Award by Kathy Moser. As you may know, Ruth and Burt Schildhouse have worked tirelessly for many years building The Columbus International Program from its beginning. Hours of effort have brought over 700 international professionals from around the world to train in Columbus and enrich our community with their culture, ideas and friendship. We are proud to announce that the Board of Trustees of the Columbus International Program has voted unanimously to create the Schildhouse Founders Fund to honor the work of Ruth and Burt and the founders of CIP. The Columbus International Program's Schildhouse Founders Fund will be used to enhance international understanding, cultural exchange, cultural inclusion and any activity that creates relationships between Americans and people from other countries. Special consideration will be given to activities that have the potential to create permanent relationships that are of a cultural or business nature. 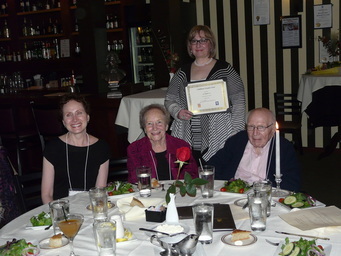 Nadia Kosvin of US Together receiving a Schildhouse grant at CIP's 40th Anniversary Celebration. Bottom left to right: Julie Jacobson, Ruth Schildhouse, Burt Schildhouse. Ruth Schildhouse graduated in 1949 with a Bachelor of Science in Social Administration. Ruth dedicated her life-long work to social activism, bridging nations through the interactions of individuals and families who are involved in the Columbus International Program (CIP). The Schildhouse family was the first to become a host family to international youth when CIP expanded to Columbus in 1960. Ruth was appointed director of the Columbus Chapter and ran the program out of her home. The dining room table was her office. She envisioned the program as an international exchange that would benefit both visiting professionals and the Columbus community. Ruth extended the program from a summer experience to a year-long exchange with the support of host families, employment for the international visitors, and personal service contracts from the state to provide stipends to all the participants. CIP was the only international exchange program of its kind to receive state funding. Ruth served as Executive Director for twenty nine years. Ruth has also served as board member and president of a wide variety of organizations throughout Ohio. President Harry Truman recognized Ruth’s dedication to activism. Applicant will be notified of the decision following the next meeting of the Schildhouse Founders Fund Board of Trustees which will take place within 45 days of quarter end. United Columbus Sister Cities International, Inc.